Fresh, Deliciously Healthy, Premium Quality Meals. Tell us your situation, and we’ll tailor a meal plan just for you. Give feedback online & we’ll adjust until it’s perfect. Enjoy fresh, delicious meals straight from our kitchen to your doorstep. Delivered straight to your doorstep, or pick up from our West LA facility. Whether you're looking for diet meals to help you lose weight or hearty, healthy meals for weight gain, NutriFit will create a plan specifically for you. You can receive any combination of breakfast, lunch, dinner and snacks. Enjoy the convenience of having fresh, organic meals delivered directly to you, or pick them up at our Los Angeles facility. Our health management meal delivery program will enable you to increase your intake of antioxidant-rich, heart healthy, organic meals, improve your blood sugar and lipid panel results and lower your consumption of sodium. Your nutritional health is in good hands with our delivered, deliciously healthy meals that are specifically tailored for diabetes, heart disease, Celiac disease, Renal diets, cancer prevention, Chronic Fatigue and IBS. We offer tailored plans that are designed to address the needs of professional and recreational athletes of all ages. Whether your goal is endurance, speed, strength or all three, we will customize your meals to help you achieve your goals. Building a winning, sports nutrition meal program is easy with NutriFit. Family Fare offers the ideal, affordable solution for busy households - featuring more than 100 fresh, wholesome entrees, salads, soups, side dishes, lunch box fare, snacks and beverages. Home meal delivery allows you to spend more time with the family, while enjoying a huge variety of deliciously healthy meals, featuring organic ingredients from our own farm. Pick up or enjoy the convenience of home delivered meals up to three times per week. Based on Jackie Keller's book, Body After Baby (Amazon Top 100 Best Seller), our Body After Baby meal program takes the work out of feeling and looking your best before, during and after your pregnancy. It's never too early, or too late, to eat well and by doing so, taking the best care of yourself, your baby and your family! pick them up at our Los Angeles facility. Learn about our liquid nutrition diet based on the NutriFit philosophy of wholesome and balanced eating, combined with the rejuvenating effects of a short-term liquid nutrition plan. NutriFit Mighty Liquid Blends are designed to allow for optimal macro-nutrient consumption while remaining a low calorie, liquid plan. Our mission is to help others live longer and healthier lives. Beyond the fresh, delicious, nutrient dense meals that we deliver, we pride ourselves on providing an exceptional level of service, and specialize in offering optimal, convenient solutions to your specific needs. Our focus is your health. We start with listening to you. Other services ask you to choose a plan, then fit yourself into it. We ask you to tell us about your needs and lifestyle, and jointly design a plan that’s perfectly suited to your goals. Whether it’s comprehensive meal plans, wellness coaching, educational programs or extraordinary NutriFit® products, our entire team is committed to helping you succeed. With NutriFit®, you’ll get the support you need and the attention you deserve. For Jackie & all my friends at NutriFit, Thank you for taking such good care of me! NutriFit believes in providing viable options for delicious, organic food to anyone living in L.A. – and beyond. The idea for developing an innovative way to bring healthier food to the masses began almost three decades ago. Formed in 1987, Jackie Keller, NutriFit director and founder, and her husband, Phil Yaney, realized many people living in the Los Angeles area preferred tasty, farm-fresh meals, but often lacked reasonable access to obtaining it. Often times, the only way to enjoy healthier fare was by visiting exclusive and expensive restaurants. Even then, organic meals were offered as occasional, specially prepared entrees that were only available to limited clientele. Keller knew that fresh, wholesome food should be the norm, not the exception, because everyone deserved a fair shot at healthy living. So, a healthy food delivery option was created and NutriFit was born. Anyone wanting to make healthier life choices, feel better and enjoy delicious food can benefit from NutriFit. That includes individuals needing to gain or lose weight, athletes, anyone with specific dietary needs and people constantly who are constantly on the go that need a meal, but still want to eat healthfully. 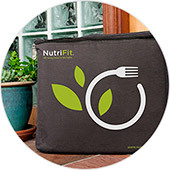 NutriFit meals are customized, personalized and specially prepared to clients’ needs and specifications. 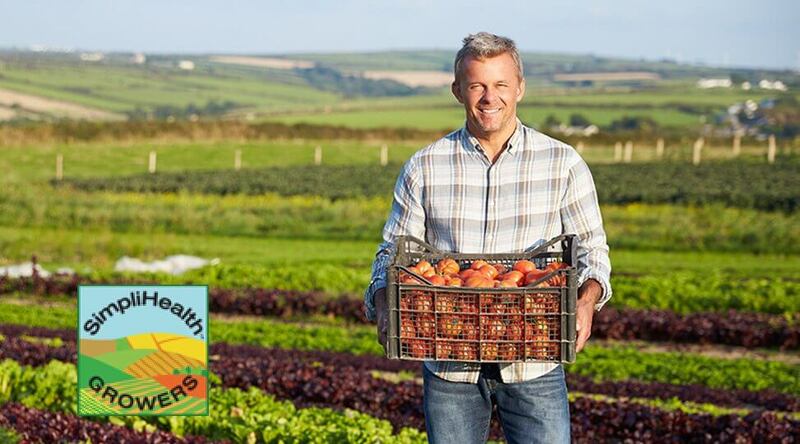 We only use the freshest ingredients, many of which are gathered from our local, sustainable farm to prepare mouthwatering meals. Our prepared meals are non-GMO, free of preservatives, and we always use organic ingredients (unless seasonal supplies are not available). We create high-quality dishes that go straight from our high quality kitchen to your front door. 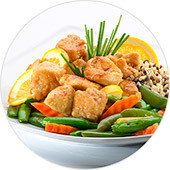 NutriFit provides dairy-free, gluten-free, vegetarian and vegan dishes, too. We deliver your meals in the early morning hours of Mondays, Wednesdays and Fridays in iced cooler bags. Monday deliveries include Monday and Tuesday meals. Wednesday includes Wednesday and Thursday meals. Friday includes Friday, Saturday, and Sunday meals. Our meal delivery service is a dream come true for anyone inside or outside of the Los Angeles area striving for a healthier diet that doesn’t compromise flavor. All meals are prepared fresh and delivered right to your doorstep. The home delivery service area covers the entire continental USA, from homes and businesses throughout our hometown of Los Angeles, to the entire east coast. 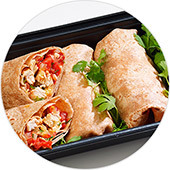 We cater to general tastes and specific dietary requirements, including providing diet food delivery. Yet, customers don’t have to limit themselves to having meals delivered. We are also happy to have you come to us and will have meals ready for pick-up if you desire.